WOODEN PADDLE, nautical decor bathroom, paddle decor, nautical wall decor, beach house decor, lake house, wooden oar, canoe oar, paddle 52"
To navigate the listings faster, please see shop sections below left for Nursery Paddles and Letters, Wedding Guest Book paddles or Paddles for Home Decor. It looks so great! Thank you so much! We absolutely love it!! I LOVE this decor. It is great quality work and came exactly as I had ordered. This custom order also came in a very timely manner. On top of having it as decor for the nursery I am excited to be able to use it in the future as a coat rack and or maybe another baby!!! Thank you so much for completing the nursery. Living on a sailboat in the Bahamas gave me ideas for creating art and home decor. I can't remember a time when I haven't been passionate about the beach and lake. My earliest memories of the beach as a wee one was giggling and splashing water on my beloved Grandmother at the edge of the surf at Atlantic Beach, N.C. I can still hear her say "ooh whee; I have to sit down! The waves make me dizzy!" I remember being fascinated by the sea creatures in the wading pools. As a child, I grew up close to Lake Norman north of Charlotte, NC and enjoyed fun filled days of fishing, swimming and water skiing. All of these childhood memories plus living aboard a sailboat in the Bahamas one long summer inspired me to do something creative with my passion for the water and sea life. Since 1997, I have been creating coastal cottage home decor under the brand name of Seaweed Designs. My bench-made cottage tables and framed artwork have appeared in Coastal Living Magazine, Better Homes and Gardens Special Interest Magazine and various other wholesale trade magazines. I was honored that Coastal Living Magazine has also used my pieces in two of their Idea Homes. A dream come true... November 2018 I bought my beach house and moved to Ocean Isle Beach, NC. I am so grateful and extremely happy in my new home. If you're looking for unique and casual nautical beach decor, I hope you will find that perfect accent at Seaweed Designs (aka Paddle Decor). 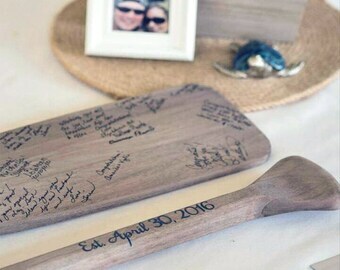 The designs currently are centralized on paddles from personalized wedding guest books paddles to personalized children's letters and paddles to home decor for your cottage, beach house, Caribbean cottage, lake home, river cabin, mountain lodge or children's bedrooms. I design and make my pieces in my home studio at Ocean Isle Beach. My helper Kirk help me with the sawing and gluing and other shop processes at his shop. I also love to create themes for sailing, flip flops, sea turtles, mermaids, surf art, beach glass, sea shells and many more. If you're in Sunset Beach May through September, please see my work in person at various craft shows in the beach area. Thank you for your interest in my nautical personalized wedding guest book paddles, nautical personalized nursery decor, paddle decor for your beach house or lake cottage. I work hard to make customer service a top priority. This means I do whatever it takes to guarantee your experience with me is a positive experience. Lead time varies from 1-3 business days to 3+ weeks. Please check Shipping & Policies tab on each individual listing for lead time and mailing charges. At this time I do not accept returns or exchanges due to the custom and labor intensive nature of my work - most items are made to order. Sometimes, despite my best intention, things may not work out. If for some reason you are not satisfied with your purchase, please contact my shop (conversation) within 3 business days of receiving the package, and I will try to accommodate you. If you purchased a stained paddle and the color wasn't exactly what you were expecting in person, please contact me. If I agree to exchange another color, you will be expected to pay for return postage (and insurance) and also will be charged for shipping the exchanged paddle back to you. If any doubt on the stain color when you order, please ask for a sample before I stain it. - I pay for insurance on your item at my own expense. Please open your item as soon as you receive it. If there is any damage, please contact me within 3 days of receipt and I will file a claim for you. In order to file a claim, I will need photos of the box address label, photo of the box if any visible damage, photo of the packaging materials (paper, bubble wrap, etc. ), photos of the damages. With receipt of the photos and description of the damage, I can file the claim and get started making another order for you. Payment is accepted via the Etsy Direct Checkout Credit Card processing system (credit cards allowed by Etsy in US Dollars), or via Paypal. I use calculated shipping. During checkout, you can choose your preferred method of USPS mailing services. - PRIORITY MAIL - USA addresses 2-3 business days to arrive from N.C.
- PARCEL SELECT - USA addresses 2-9 business days to arrive from N.C.
* - PRIORITY MAIL INTERNATIONAL - Canada and Australia, 10+ days to clear customs and arrive at address. - USPS PARCEL SELECT: Could take 3+ weeks for delivery. It is my understanding the package is held in CA for a full container and shipped by boat. - USPS PRIORITY MAIL (plane - allow 2 weeks or less) is faster and more reliable delivery. - I offer USPS International Priority Mail with country maximum weight limit of 20 pounds. - Due to country limits of 42" length box, I can only mail 35" and 41" paddles to Australia. Please refer to this section prior to placing an order so that you have a clear picture of how long it will take for your item to be made and add in the time it takes for USPS to deliver. Shipping times vary from product to product. My listings lead-time vary beween 3+ business days to 4 weeks. - I pay for insurance on your item at my own expense. - Additional customs charges, fees or taxes may be due when you receive your package. These charges are your responsibility and are decided by the country of your residence. These charges are NOT included in the price of shipping. No refunds will be given to cover these charges. The shipping charges you paid at the time of your purchase are those charged to us by the USPS, not your country of residence. All photos, designs, patterns, title and description contained within seaweeddesigns shop, products, website and materials are the intellectual property of seaweeddesigns and may not be copied, reproduced, distributed or displayed without seaweeddesigns express written permission. I reserve the right to reuse all custom designs/silhouettes created either for resale or advertising. Under no circumstance will I sell any personal information to a third party. - I would be delighted if you could take a moment to leave feedback regarding your experience. I value your honest advice and any constructed criticism as I strive to offer the best of service and products in my shop as Seaweed Designs. If there is an issue, please contact me before you proceed to leaving a negative review. Most of the time, issues are resolved by a simple email. I appreciate your courtesy. - I reserve the right to refuse offering my items and/or canceling a sale to anyone proved to harm my business in any way.